Specially shaped for a perfect fit, perfect for easy storage of your Artificial Christmas Tree once Christmas is over! 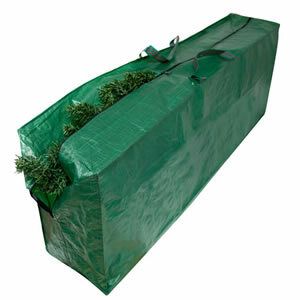 This fully zipped bag has strong webbing handles and stores Christmas Trees up to 9ft tall (depending on tree construction). Ideal for Christmas Lights, Baubles & Decorations, it’s shaped for a perfect fit to keep all your decorations clean & tidy for another year. Easy to store in your Loft, Shed or Garage and fully zipped with wipe clean surfaces & strong webbing handles. Don’t get all your decorations tangled up, get them organised with this! With a velcro fastening flap & hang up hook for easy storage on a door or in a cupboard these bags provide easy storage of your Christmas & Birthday Gift Wrapping Paper. Each sleeve holds between 4-6 rolls depending on diameter and includes a handy pocket on front for storage of gift tags etc. No more bent or torn wrapping paper with these!